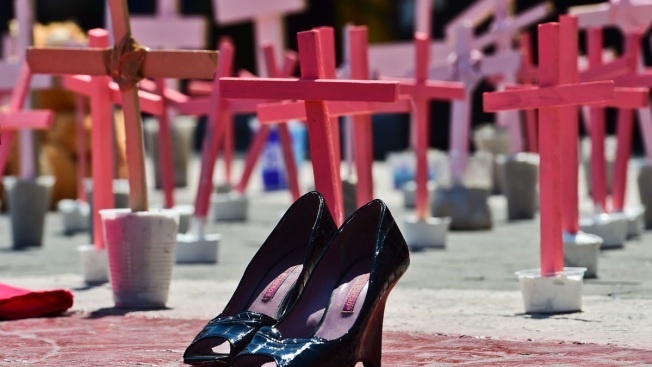 In this March 13, 2016, file photo, high-heeled shoes from a victim of femicide are pictured next to crosses during a protest against the murder of more than 600 women in the last four years, in Ecatepec, State of Mexico. A Mexican couple caught carrying dismembered human remains in a baby carriage may have killed as many as 20 women, a top prosecutor said Monday. "What seemed macabre to me is that this person mentioned 10 cases in which he gives details, the names of the victims; he gave us the clothing they had on at the time," Gomez said. "He seemed happy about what he had done." The couple, who were identified only be their first names in a police statement, also reportedly confessed that they had sold one of the dead women's 2-month-old baby to another couple. The baby was recovered and the other couple was detained. Mexico State, which borders Mexico City to the east, north and west, has suffered from waves of women's killings in recent years.